The Fourth and, so far, the final instalment of The Early Adventures range comes in the form of The Crash of the UK-201 by Jonathan Morris. It is a Vikki-centric story which features plenty of excitement and heart-breaking moments and might just be one of the best adventures that this entire range has to offer! 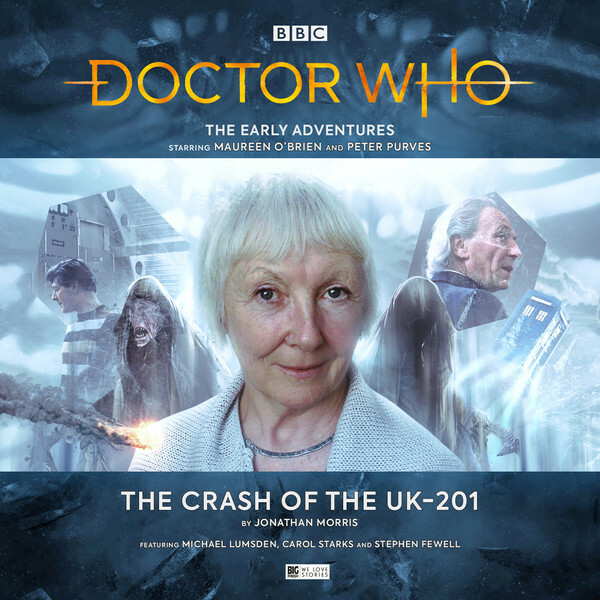 The Crash of the UK-201 is a very emotionally charged Doctor Who adventure and given the tragic circumstances surrounding Vikki’s youth, it is hardly surprising that Jonathan Morris had grasped hold of that part of her character. When she first crossed paths with the Doctor, she was the sole survivor of a ship crash on the planet Dido. And then she discovered that the man she had thought her friend was the one responsible for the deaths of everyone on board, including her father. But the reason she slotted in so well with this particular TARDIS team was that the Doctor had just said goodbye to Susan at the end of The Dalek Invasion of Earth. Vikki felt like another granddaughter to the Doctor and so they went on many happy adventures together. Morris takes Vikki down an interesting direction in this story though, making her seemingly forget all the lessons the Doctor had taught her on their previous adventures. The Doctor had previously warned her about changing the past in stories like The Romans and The Time Meddler. But naturally, she gives in to her desire to save everyone, particularly her father. When Steven turns up, the Doctor had sent him down Vikki’s personal timeline, she uses his piloting skills to safely land the ship on Dido, instead of it crashing down. While Vikki keeps things a secret concerning where they have landed, when Stephen works it out, he understands that he has become a huge paradox. Since Vikki never joined Ian and Barbara, the TARDIS, her actions never guided the TARDIS to Mechanus, where they would have rescued him otherwise. In usual Morris tradition, this is a story that is told in a non-linear way. Steven pops up through Vikki’s timeline as she gradually gets older. While we fans know that things will have to go back to normal in the end, it doesn’t mean we can’t enjoy the ride in the meantime. It is lovely to hear Vikki starting a family and being happy, despite some of the very tragic things that happen to her along the way. Of course, this being Doctor Who, we’ve got some interesting monsters in the form of cloaked creatures who feed of paradoxes. While that sounds a little like The Weeping Angels and the Reapers from Modern Who, it is nice to finally hear the Classic era is beginning to tap into these new additions to the mythology. Morris handles these creatures brilliantly, never overusing them and so, as a result, the few moments they are there, they feel really creepy and there is a sense of threat to them. The standout performance here comes from Maureen O’Brien who manages to display such a wide range of emotions, sometimes in the same sentence. She is really excellent here and Morris’ script also gives her the opportunity to use her natural voice as Vikki gets older and doesn’t ask her to turn the clock back to 1964. But when O’Brien is in young Vikki-mode, she is excellent as always, reminding us why she is such a great addition to the cast and a welcome presence at Big Finish. She really seems to love this script and that comes across very nicely in the way she pitches her performance. While this may be the last in the series of Early Adventures, I hope it isn’t going to be the last we hear from her with Big Finish! Peter Purves is, of course, excellent as always. The Doctor is hardly in this story but unlike other stories in this series, his presence isn’t really needed as it is a story about the companions. The fleeting moments he does appear though, Purves does a great turn as Hartnell. On hand to add some narration to proceedings, Purves does a great job and like Maureen, the pair brings the story to vivid life, thanks to the excellent script from Jonathan Morris. His turn as Steven is excellent too. It was interesting to hear Steven interacting with Vikki as she gets older. He is the usual Steven when he finds himself on the UK-201, calling Vikki out on her tampering with the timeline but also understanding why she had to do it. But as the story goes on and Steven turns up fleetingly throughout Vikki’s later life, he seems to understand that she has that much more life experience than him and he treats her accordingly. It was fun to her Purves tackle this and he and Maureen rise to the challenge brilliantly. Yet again, it is another reminder why this TARDIS crew is one of the most criminally underrated in the show’s history! Overall though, The Crash of the UK-201 is a triumph. With a strong script from Jonathan Morris, fantastic performances from Maureen O’Brien and Peter Purves and the guest cast and strong direction from Lisa Bowerman, for now, it is a strong way for The Early Adventures range to bow out. So when she suddenly wakes up in her cabin on the UK-201 again, without her friends, a few days before the accident, she’s faced with a stark choice… Can she stop the crash from happening? And if she can, should she? Maureen O’Brien (Vicki / Narrator), Peter Purves (Steven Taylor / The Doctor / Narrator), Michael Lumsden (Newton Pallister), Carol Starks (Captain Odessa Grey), Jemma Churchill (Carmen Scheffler), Arthur Hughes (Lieutenant Thorpe), Stephen Fewell (Jeran Dalton), Eve Webster (Carla / Maria Dalton), David Cooke (Additional Voices). Other parts played by members of the cast.